MUSIC Matters, since its founding in 2011, has always understood the value of an education such as the one that the University of Michigan provides. However, with that understanding comes the recognition that college affordability is a problem many students seeking higher education face. So, in 2013, we founded the Big Thinkers Scholarship, a student-funded, need-based, endowed scholarship, and one of the first of its kind. The $50,000 endowment generates roughly two $2,000 scholarships per year, which are open to all current and incoming University of Michigan students. Two years ago, we awarded this scholarship to high school student Zahra Makki, who we felt embodied the essence of a “big thinker.” She was born in Beirut, Lebanon, but moved to Dearborn, Michigan in 2006. She is now a sophomore at the University of Michigan, and, on campus, is involved in the Arab Student Association, Arabesque, and the Michigan Refugee Assistance Program. Zahra plans to major in either Public Health or Computer Science, and enjoys learning from and working with her peers, both inside and outside of the classroom. We have greatly enjoyed watching her succeed at the University of Michigan, and we can’t wait to see where she goes next! Each year, the scholarship is accompanied by a theme. Two years ago, in alignment with the university’s goals and values, the theme was focused around the idea of civic leadership. We were searching for a scholarship applicant who we felt wasn’t afraid to push the boundaries, “think big,” and positively impact the Ann Arbor community for years to come, and we found this in Zahra. This year, our theme is Change. MUSIC Matters has experienced a large amount of change during these past few years, and from this change we feel as though we have emerged a stronger and more impactful organization. Most notably, we have updated our mission statement to focus more on our education-centered community outreach endeavours and values. Because we know the world around us is constantly evolving, we are always searching for new ways to adapt to it and further our involvement in the community in new ways. We aim to find two open-minded and perseverant scholarship applicants with a desire to bring about a positive change in our community and a willingness to learn from and collaborate with others. 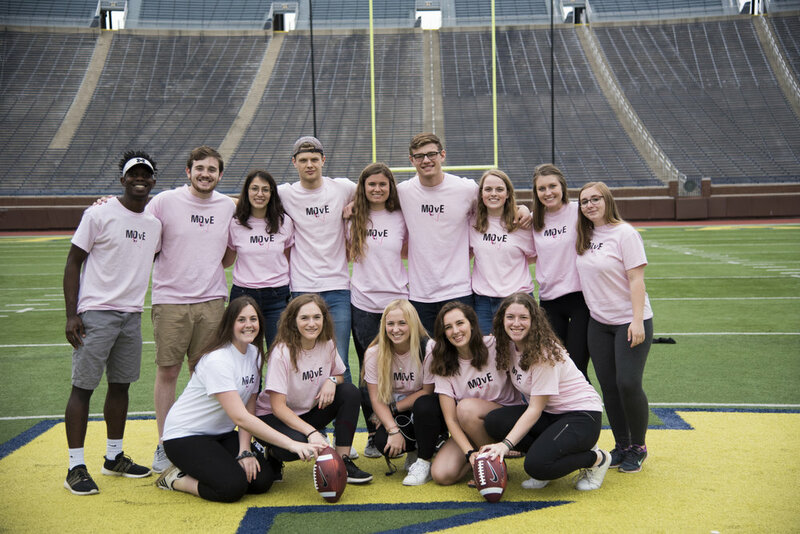 MUSIC Matters takes incredible pride in having the opportunity to help fellow and future University of Michigan students and make a true difference on campus and within the community at large. This year’s scholarship application closed on February 15, and we cannot wait to select the winners later this semester! In Fall 2017, MUSIC Matters launched the CoMMunity Partnership, a $2,500 grant that we provide to student organizations on campus so that we can work together with them to help them benefit the community. Last year, our 2017-2018 CoMMunity Partner was Books for a Benefit. We worked with this fellow student nonprofit organization to help them build a library in Flint, Michigan. MUSIC Matters members collected over one thousand book donations and helped stock, decorate, paint and transform The Sylvester Broome Empowerment Village into a beautiful library for the Flint community. This year, after hearing from four incredible student organizations, our members selected Michigan Movement and Heal-Move-Shift to be our CoMMunity Partners of 2018-2019. The CoMMunity Partnership is an important part of MUSIC Matters because one of the organization’s main goals is to impact the community in positive ways. Hearing from these four organizations was a very impactful because our members were able to see the amazing changes the students from these organizations are making on our campus, surrounding community, and across the globe. It reminds us of why we all joined MUSIC Matters in the first place: to unite the community through a shared love of music and helping others through social ventures. Ultimately, our members chose two incredible organizations to work with for the CoMMunity Partnership. Michigan Movement is a student-run 501(C)(3) nonprofit that provides aid to individuals, families, and students experiencing homeless in Ann Arbor. 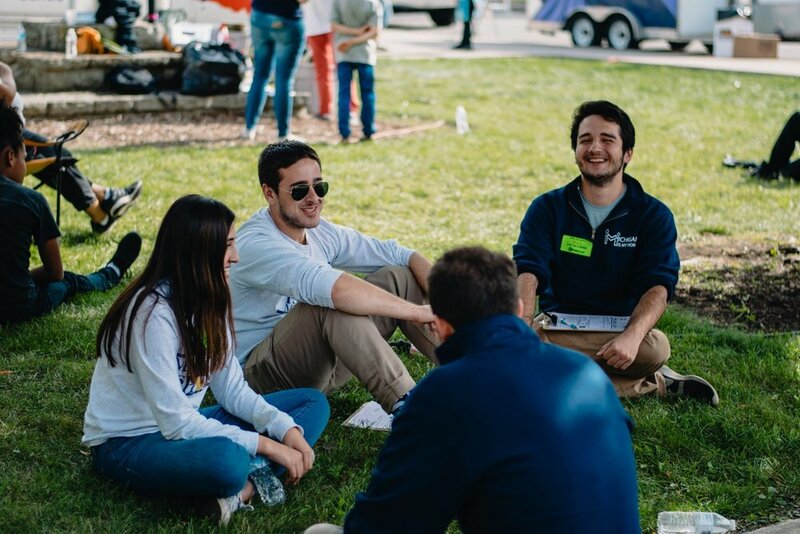 They are the only organization on campus whose main goal is to provide aid to those experiencing homelessness and they do so by empowering the homeless by directly working with them. Michigan Movement helps the homeless by first consulting with them and assessing needs, and then distributing care packages consisting of food, clothes, hygiene supplies, and resource lists. Among other projects to increase awareness, the organization also volunteers and partners with Mercy House and Avalon Housing, two local organizations that help the homeless. MUSIC Matters hopes to work with them in order to aid the homeless in our community and help the organization of achieving their goal to expand outside of the Ann Arbor community. MUSIC Matters will also be partnering with Heal-Move-Shift, a student organization that works with Middle Eastern and North African communities in Michigan through health training and education programs. The organization hopes to heal the community, move the conversation towards a healthier direction, and shift the stigma away from health concerns through engagement with Ann Arbor and Detroit communities. 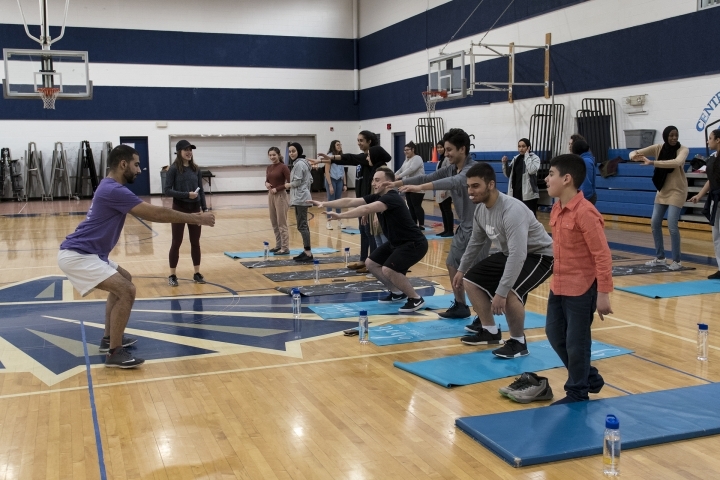 The organization works with Crestwood High School in Dearborn Heights, Michigan and Central Academy Pilot Program in Ann Arbor on the three tenets of nutritional health, cardiovascular health, and mental health. MUSIC Matters has partnered with Heal-Move-Shift in order to help them achieve their goals of expanding their programs to other schools. With these two CoMMunity Partnerships, MUSIC Matters is expanding their influence in the Ann Arbor and Michigan community in hopes of making real, positive change. With the help of Michigan Movement and Heal-Move-Shift, our members can engage with the community even further while continuing to inspire others through music. For those who may not know, the MUSIC in MUSIC Matters actually stands for Michigan Undergrads Serving In the Community, and although a large goal of our organization is to unite the campus through music, we also work to unite our campus through our different social ventures. Last year, MUSIC Matters debuted the CoMMunity Partnership, a new social venture aimed to help other social impact-based student organizations by providing them with a grant for up to $2500 and hands-on help from our members to complete a project. Last year, we kicked off the CoMMunity Partnership by working with the incredible Books for a Benefit, an organization whose values we found to really align with the values of MUSIC Matters. Together, we planned and executed a library build in Flint, MI. 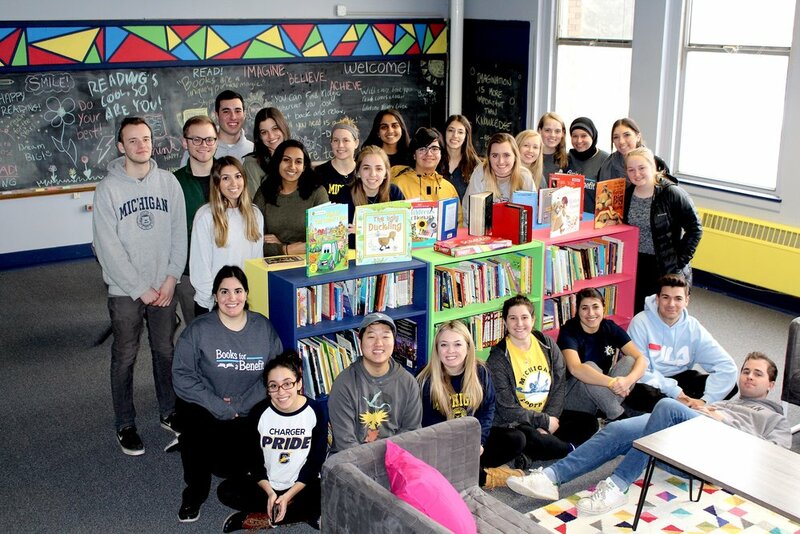 From organizing a book drive to having hundreds of students sign bookshelves at SpringFest, putting the minds and power of our two organizations together allowed us to create social impact that would not have been possible without the support of each and every member of both organizations. Witnessing the transformation from a boring space to a vibrant library was extremely rewarding, and this year our impact is going to grow even stronger. For the 2018-2019 school year, MUSIC Matters is fortunate enough to be able to have two Community Partners. As our CoMMunity Partnership grows, our club’s presence as a social impact organization grows, too. Seeing how passionate all of our members and other organizations are about the CoMMunity Partnership is so exciting, and I can only imagine where this year’s Partnerships will take us. MUSIC Matters is more than just music -- it’s making a difference by bringing people together. Imagine. Imagine a world where every single child has the opportunity to go to college. Imagine a world where every student has a role model to look up to and inspire them to keep moving forward. Imagine a world where every kid had a way to get even their most random of questions answered so they weren’t afraid to take a leap and reach for their goals. That’s what MOvE is. That’s what MOvE does. What is MOvE? You’ve (hopefully) read all the articles, all the social media posts about what we do and what our goal is, to inspire, encourage, and educate high school students from Henry Ford Academy about college and the future. But the thing we haven’t been able to genuinely show you is the true impact MOvE has. It’s so much more than those 48 hours. The influence, the relationships, and the memories are not confined to one weekend in the summer. It’s the ripple effect afterwards. One interaction that seems so small starts the ripple that keeps moving outwards until now it’s ideally created social change. No, when I say social change I don’t mean we find the cure for cancer or end world hunger in one weekend. No, we didn’t find the perfect way to achieve equality everywhere, but we did ignite the fire within each other and that’s where change stems from. Whether it’s telling the kid who spends all of his free time sketching that he can pursue his dream of being an artist, spending over an hour with a student talking about all the possible paths in college for their interests and talents, or sharing your own goals for the future as you all talk about where you want to be in 10 years, we lit a spark within each other. On Friday we were all sitting in a room surround by strangers, but on Sunday we parted ways from our friends, supporters, and the people who will continue to hold us accountable to our goals and dreams. I have had the pleasure and opportunity to have worked on this summer camp from all perspectives. From the many hours in and out of the library working on curriculum and logistics to counselor training the morning the students arrived, along with four others I ate, slept, and breathed MOvE. To me, this is what MUSIC Matters was – some small summer camp we put on for a local high school. Walking out of Mojo on Sunday, May 19th, I realized that MOvE is so much more than that. Personally, I met some of the most amazing kids I have ever known that weekend (I hope you guys are reading this now). They explained to me their struggles within all sorts of relationships, gushed over their goals of going to Harvard to study medicine, displayed their talents drawing caricatures, and told their jokes that made me laugh so hard I actually shed tears. Over the course of lunch on Saturday, I saw not only these few students but all of the students open up as they got more comfortable with the camera and I valiantly attempted to capture their multidimensional personalities that I know one day will move mountains. To me MOvE was so much more than inspiring them, because they inspired me. They reminded me why it’s so important to set your goals high and your standards even higher. They showed me to see the good in every situation and reminded me that unless it’s going to matter in five years, don’t spend more than five minutes worrying about it. They reminded me that you can do anything you put your mind to, no matter how big or how small. These kids might not even know how powerful of an impact they have, but it just goes to show how important every interaction truly is. In the end, you can’t always find the right words to grasp something that has impacted you so greatly. MOvE moves you. Each and every student there, college and high school alike, took something from that camp. Whether it be life changing or simply a fond memory, it MOvEd us for the better. I would give so much so that everyone could have an experience like that- from both ends, but that’s not possible so I hope that after reading this you would at least get a taste and a reminder that you matter, your goals matter, your actions matter, and of course MUSIC Matters. Read about Counselor Belinda Jiang’s experiences attending MUSIC Matters first ever MOvE Camp last summer! This upcoming weekend we’re doing it all again so check out a sneak peek of what is in store! Read about our past year teaming with Books for a benefit and all of the amazing service events we performed as part of our CoMMunity Partnership! Read about one of our Big Thinker Scholarship recipients Zahra! Check out what makes her truly embody a “big thinker”! Read about the library we built in Flint, Michigan with Books for a Benefit as part of our CoMMunity Partnership! Read about out our recap of the first ever MOvE, Michigan Overnight Experience! After years of planning , MUSIC Matters has finally implemented our amazing summer camp and its only the beginning! This Fall MUSIC Matters revealed its new social ventures initiative, CoMMunity Partnership! This year MUSIC Matters is partnering with Books For A Benefit, a fellow social ventures organization on campus, to assist them in their service endeavors!